I’ve heard often lately, “people don’t have any money to spend.” While seemingly true, that would lead one to the erroneous conclusion that more money is needed. In reality, some people don’t have any money to spend now, but that is a reflection on their individual consumer time preferences. Others in fact have plenty of money to spend. But that leads us back to the solution, which is exactly the opposite of what is being prescribed and administered. It was too much money in the first place that created the current crisis. Too much money, what has always been known classically as inflation, is destructive. It destroys the value of people’s money holdings. It destroys capital valuation and wealth. It leads individuals and businesses to do things they otherwise would not, nor ever, do. A simple analogy will help explain this. Yes, there are millions of examples already describing the destructive power of excessive money and the effects of inflation. And it’s not as if history hasn’t shown us the exact problem multiple times throughout the centuries either. But lets do another! Rather then starting off with a desert island and two people, we’ll start with a modern economy. This would of course be a money economy, which simply means that they use something that serves as a medium of exchange. We can call it gold, or silver, or any other commodity that is readily accepted, or the paper certificates that require redemption for said commodity upon presentation. Whichever the case, the money supply is fixed according to the quantity of the commodity. In this economy, there is a level of production already occurring, there are consumers, businesses that invest in capital, and a thriving international trade sector as well. Then, the government decides that the key to prosperity is printing money and begins to replace the commodity currency with fiat currency. Now, lets also stipulate that at the end of the replacement, the amount of fiat money is exactly equal to the commodity money so that there is no inflation initially. Okay, the economy should not experience any ill effects even though the commodity currency has been taken out of circulation. Had both currencies been kept in circulation, we’d of course have seen Grisham’s Law take hold. Now, all is ostensibly running smoothly until the printing presses go to work. If there’s an extension of credit via central banking, we’ll get an unsustainable boom fueled by malinvestment. That alone leads to much destruction and good investments are shunned for the bad, as the bad become much cheaper than they otherwise would. And as resources are diverted which should have gone to more productive ventures, the economy is impoverished. But instead, this government decides that they’re going to helicopter the money in so to speak. It could do this through a variety of measures, so we’ll choose the easiest, and oddly enough, mot politically expedient and rewarding: direct cash transfer. Maybe the central bank buys up the government debt, or maybe the government just prints the money and deposits it into the central bank. Does it really even matter? The checks are still going to households, being deposited in banks, and increasing the cash holdings of consumers. The idea hatched as a scheme to help speed the economy up through greater demand. If people have more money, they’ll spend more, businesses will need to sell more, produce more, hire more, and so on. Such logic seems so simple, and hey, some economists even became famous for such trickery. But it too is a destructive path. With the increased money, yes, consumers will demand more. But, there won’t be the level of goods commensurate with the new amount of money. Soon, businesses will catch on and prices will rise. However, prices will not all rise at once. The asynchronous changes in the price level create a major problem: new money at old prices versus old money at new prices. In other words, whomever receives, or spends, the money first, wins. Those who wait, or get the money late, lose. But here’s the real destructive part: prior cash holdings have been reduced in value. Everything saved previously has been seen its value eroded, simply from the act of printing money. The economy isn’t producing more, and probably is producing less as resources were diverted away from wealth creating activities into unsustainable ones. Even if producing at the same level, prices will have risen, meaning that to consume the same amount, more needs to be spent. Wealth has been destroyed. So, as we can see, printing money is a destructive act. Since more money is not only destructive, but the root of the current mess, the answer is obviously less money. Too much money is a bad thing, and the remedy, oddly enough, is to reduce the supply of money. Now, this runs counter to every “mainstream” text on recessions. But as we’ve learned all too well, about all “mainstream” economics has done for the past century is create boom and bust cycles, followed up with more interventionist policies, which creates more boom and bust cycles. And our current situation is the ne plus ultra of busts created by the mass creation of money. Reducing the money supply (yes, that’s “artificial” too, as the real remedy is 100% commodity currency.) will restore value to the currency, or at the least initially, stem the destructive process. For all those that saved, their holdings will increase in value. For others, the purchasing power of their incomes will increase. And in the most ironic of outcomes, there is gain from destruction, so long as the destruction is only of fiat currency. I don’t expect to hear dear leader, or any of his minion, pressing for less money. I certainly don’t expect to hear it from our overlords at the Fed. But the answer is actually less money, strange as it seems. It was assumed for a long time by a certain political persuasion that poverty is a “root cause” of crime. All we need to do is alleviate poverty and mirable dictu, crime solved. Of course, the most generous of welfare states and localities became hotbeds for criminality. But then again, crime begets crime. When the state is looting first, it sets the precedent. Here’s an interesting headline from the LA Times: Los Angeles crime rates plunge despite weak economy. Crime in Los Angeles County dropped again in 2009 despite rising unemployment and the bad economy, continuing a slide that has pushed homicides to levels not seen since the 1960s. You really have to appreciate the “despite rising unemployment”. The causal-realist approach to problems would be most helpful here. One doesn’t commit crime unless one first has no respect for property rights. In fact, crime is committed by criminals, it doesn’t “just happen”. This is again the product of Keynesian/leftist thinking, that if the government affixes the right remedies, everything will work out. The overall progress made this year around the country further refuted a once widely accepted belief that crime rates rise amid economic downturns. Perhaps we can get rid of other widely accepted economic beliefs, like governments can stimulate economies and printing money creates wealth. Since being appointed last month, Beck has echoed that notion, warning that the department will not be able to sustain current crime levels, let alone improve on them, if budget cuts force the LAPD to shrink. Because apparently, it’s not citizens who are responsible, it’s the police state. When crime goes up, we need more cops. When crime goes down, we need more cops. Makes perfect sense doesn’t it. Yes, it’s been a while since I posted. Seems not much to post on even though we are undergoing to the most radical transformation of our economy in history. My thoughts have always been to develop this as a repository for comments and analysis from the Austrian perspective and not as some daily commentary on current happenings. So, even though there is much to address, I don’t want to just add to the chatter out there. I was asked the other day by a colleague “When did the bubble burst?” I surmised that it burst at the time the real interest rate went positive. I tried to explain it briefly, but that proved a daunting task. So I will expound on that premise further. The Real Interest Rate is simply the rate of interest charged by banks for instance, minus the inflation rate. Thus, if one is paid 5% on a $100 deposit, at the end of the year he will have earned $5 interest. Thus his total deposit will now be $105. If inflation (again, using the common definition meaning rising prices. Austrians know the true meaning of inflation is artificial expansion of the money supply. Higher prices are the result of inflation) is 3% then the original $100 will need to be $103 to retain its purchasing power. Thus, of the $5 earned in interest, $3 were lost to inflation. Thus, the depositor would have earned in actuality, only $2. This is one of the many. many reasons why inflation is destructive for an economy and causes the gross misallocations of resources. It not only destroys value but it distorts future decisions. The trap far too many people fall into (even notable Nobel laureates!!) is that money is money. That the dollar one has in their pocket is the same as the dollar anyone else has in their pocket. Not true. This is because people typically only think of money in its functionary status: medium of exchange. That is, we simply see money as what we use to acquire that which we desire. And when one understand the money as commodity principle, then they will be able to see that people aren’t using money to acquire the goods and services they desire. They are trading a less desirable good (money) for a more desirable good. And it works in opposite as well. The less desirable good (for example a car) is being traded for the more desirable good (money). As Mises (and others) explained, money originated first as a commodity. It was something that in itself was desirable. What made it “money” was that it held many other properties as well. Money needed to be divisible into usable units, had to be durable, and had to be readily accepted by all. Gold (and of course silver) had all of those qualities. That is why in the ancient world gold coins from one empire were readily accepted by merchants in other empires. And why not? Certainly the imprinted likeness of some wannabe demigod generated no admiration among foreign peoples, but the metal certainly did. It is also the reason trade flourished so well in the ancient world. Gold is gold is gold. Anywhere, everywhere, always. Now, once one understands money itself is a desired good (which is one of the many reasons why our current fiat paper currency is such a disastrous system, as who wants worthless pieces of paper!!!) then we begin to understand money as a commodity. Now, the other factor is price. All commodities have a price, and for money, the price is the interest rate. In fact, that is a basic concept in economics, interest rate as the price of money. Just look at any introductory economics text and you’ll see a graph with a downward sloping demand curve for money, a vertical supply curve for money, IR on the vertical axis, and quantity of money on the horizontal axis. This graph will differ not all from any other graph. Thus, the interest rate is the price of money. Since money is a good, one with a price, it begins to make clearer the understanding of when the bubble burst. The money one currently possesses has a cost. In other words, using the money one currently has means one must give up something. Cash in the pocket has a cost too, it means that one forgoes any interest. However, since most cash holdings are small, it’s negligible. And, it also means one prefers greater liquidity. But, consider the money in an account earning interest. Using that money comes with a cost, forgoing the interest earned. And here is where it gets tricky. Should one desire to make a purchase requiring using stored money, either investment or consumption, that purchase comes with a cost beyond the actual dollar amount. If one needs to liquidate such holdings than they are forgoing the interest earned. Now, that particular block of money has a cost. That’s established. So, let’s examine an example. If one’s holdings are earning %5 interest when there’s 3% inflation, then the real interest rate is 2%. This means that using the money costs 2%, and thus any use of such money must return greater than a 2% gain. There would of course be risk premiums and the like, but for the sake of simplicity, we’ll leave those aside. Now, what happens when the Fed pushes the interest rates below the market rate? It lowers the price of money and makes new money cheaper than old money. Whoa, how is some money cheaper than other money? Isn’t it all the same value? Remember, if the real interest rate is 2%, then using stored reserves costs 2%. In other words, the price of that money is 2%. But, when the fed lowers rates it lowers the price of new money only. Thus, new money borrowed becomes cheaper than old money borrowed. 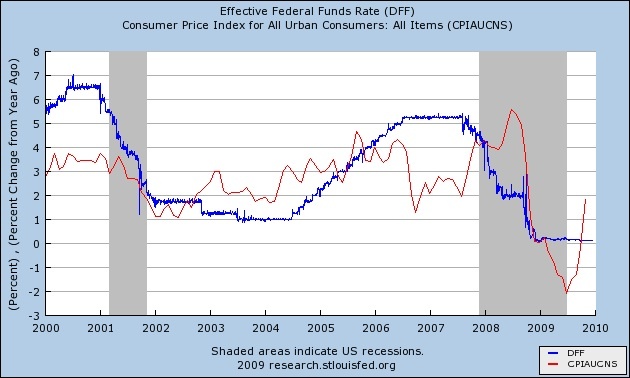 (Notice in the graph below, the fed funds rate fell below 2% for a considerable length of time.) And instead of liquidating assets, one would borrow the newly printed money. Even if not “printed”, the newly expanded credit is the exact same thing. What happens when the fed lowers the interest rate so low it becomes negative? Picture a tsunami!! What happened during the bubble? Look carefully at the graph. From mid 2002 to late 2005, the inflation rate was greater than the interest rate. Thus, during this time, the real interest rate was negative. Right around the end of 2005, though the fed had been ratcheting up the interest rate for quite some time, the real interest rate went positive. That was the proverbial straw. The United States housing bubble was an economic bubble affecting many parts of the United States housing market, including areas of California, Florida, Nevada, Arizona, Oregon, Colorado, Michigan, the Northeast megalopolis, and the Southwest markets. At the national level, housing prices peaked in early 2005, started to decline in 2006, and may not yet have hit bottom. The market crashed right about the time the real interest rate turned positive. If one hasn’t any money in savings, one still borrows (excessively!!) as one is rewarded for doing so. Here’s why. Recall that the real interest rate is the interest rate minus inflation. Now, we tend to think of interest solely as what we pay when we borrow. But savers are in essence the lenders: first to the banks then indirectly to businesses, et al. Simple analogy, but sufficient for this. But, how does it reward borrowing? If I can borrow $100 at 1% and the inflation is 3%, I need only pay back $101, while to keep pace I’d need to repay $103. In other words, while the lender loses $2, the borrower GAINS $2. Thus the borrower gains simply by the act of borrowing. Except, who’s going to lend money in this scenario? Nobody will lend their money at all. But the Fed will, via credit expansion. So we ended up with a situation where the fed was funneling newly created money into a market whereby borrowing, for anything, was rewarded. Not the result of the borrowing, i.e. investment and wealth creation, but simply borrowing for the sake of borrowing. Imagine a world turned upside down, where one is rewarded for profligacy and punished for thrift. Imagine a world where capital destruction creates gain, Bastiat be damned. And for several years, that was the economic world that the fed created. And when it began to be turned right side up again, well, things fell very hard. The bubble burst almost precisely when the real interest rate turned positive. Skidding to a halt came the entire system of asset inflation, borrowing against homes, and rewarding indebtedness. The destruction of the past decade is only now slowly being revealed. So, how do our masters of the universe, the Fed, plan on dealing with the current situation? With 0% interest rates. Because, as they say, what doesn’t kill you, probably just required more effort. You are currently browsing the Never Giving In blog archives for December, 2009.